BEST ON-TRACK MOMENT: Winning three races in a row to close the 2015 Bojangles’ Summer Shootout after a rear shock failure took him out of the race in Round 7. BEST OFF-TRACK MOMENT: Rallying his AK Performance team after the DNF, as well as during finale night after a crash during his heat race nearly left him unable to start the final main event. Bandolero Outlaws competitor Ashton Higgins has put together a season that most short track racers across America would be jealous of. 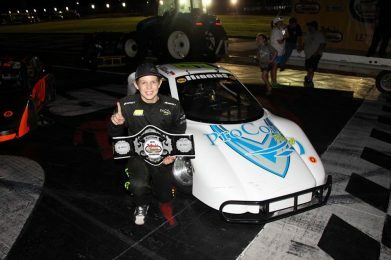 The 12-year-old from Weaverville, N.C. won the Atlanta Motor Speedway Thursday Thunder championship in dominating fashion, winning six of the 10 races at AMS, and followed that performance up with seven wins at the Bojangles’ Summer Shootout en route to his first career title at the Charlotte Motor Speedway. If you do the math, that’s 13 wins in 18 starts this summer — or a 72% winning ratio — for the young driver who becomes the second consecutive Bandolero Outlaw to sweep Atlanta and Charlotte in the same season, after Jensen Jorgensen accomplished the feat a year ago. Higgins also won his divisional race during Friday night’s Racing Electronics “Madhouse Mania” event at Bowman Gray Stadium, one of the most prestigious single events for USLCI compeitiors all season, as a prelude to this weekend’s Bandolero Nationals. The INEX Bandolero Nationals take place this Thursday and Friday, August 7-8, at CMS and serves as the national championship race for all Bandolero drivers across the United States and Canada. Finishing position in the main event is used as the tiebreaker to determine final points positions for any deadlocked drivers in the title hunt — including the champion. That means if multiple drivers are maxed out at 2,000 points at the end of the season, whichever of those drivers had the highest finish in this weekend’s Nationals would earn the national championship, and Higgins is hoping that driver will be him. With Higgins having already maxed out his points total at 2,000, if he wins the Nationals he will automatically clinch the 2015 Bandolero Outlaws national title by virtue of the rulebook, explained above. That would make Higgins just the second Bandolero driver in history to complete the perfect season — joining Jorgensen in sweeping Atlanta, Charlotte, the Nationals and the season-long championship all in the same year. Has the self-proclaimed prankster with a love for riding dirt bikes in his spare time allowed himself to think about that fact just yet? For more information on U.S. Legend Cars International, visit www.uslegendcars.com, and for more information on the Bojangles’ Summer Shootout, visit www.charlottemotorspeedway.com.